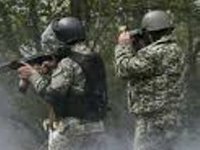 Six people died in clashes in Kramatorsk on June 16, the Donetsk regional administration press office said in a statement on Tuesday citing health department. Thirteen people have sought medical attention, the health department said. "Eight of them have been hospitalized in different condition. The issue of transporting some to regional treatment and preventive facilities is being resolved," the document said. At the same time, no people dead or injured were registered in local medical facilities following the forceful operation in Horlivka on June 16, the regional administration said.